Usually, when I write about what’s going on for me, I seem to engage in deep, philosophical questions about strength or what I’ve learnt on my journey into entrepreneurship. Today, I want to talk about last week. Something much more practical. Because for me, last week was a lesson in how easy it can be to move away from balance and start behaving in a way that really isn’t conducive to health or happiness. I shared at the end of August how energised and motivated I felt for the new season. I started a new accelerator programme with The Trampery and even started working with a business coach. I’ve been trialing an exciting new product - a personalised, practical balance plan - and have been doing lots of work on refining the brand. So I threw myself into the week. There were events on every evening that I just had to go to. Events I wanted to go to. My days were packed with work and coaching clients. Two mornings, I even went to breakfast events so I left home before 7am (after getting up to run at 5am) and didn’t get back until 10pm without much of a break along the way. All the things I teach people not to do. And by Friday, I felt it. I was exhausted and struggling to focus. I didn’t want to run or eat...unless it was takeaway or cake. I’m not sure I would normally have noticed this particularly but I’m about to start working with a nutritionist to help balance my hormones and so I’ve been keeping a food diary. Now, I have to say here, that I had a great week. I got so much work done, met some amazing new people, spent time with friends, gave a really hot guy my phone number, and signed up a new client. And it would be so easy to look at those results and say “I should keep working like this”. But I know that pace isn’t sustainable for me. If it’s impacting my ability to maintain those basic pillars of wellness - like nutrition and exercise - it’s not quite right. Basically, I forgot the key rule that these practices only work when you actually do them. Thinking about them, teaching them to other people...none of that counts if you’re not actually showing up and putting it into action. I was in that place of “yeah, I feel amazing and I know what I’m doing so I don’t need to do x, y and z”. I thought I could do it all - I wanted to do it all - and it was all fine until I ran headfirst into the brickwall of the weekend. What saved me and has allowed me to course-correct quickly is what I like to call ‘mindful monitoring’. That is, paying deliberate attention to the basic pillars of our wellbeing. It means more than just thinking about it - we are often terrible witnesses to our own experience - so writing it down somewhere and paying attention to the patterns. I have a couple of different tools to help me do this. I use an app to track my menstrual cycle and the corresponding energy shifts. And I also built my very own little Google Form, which allows me to keep track of some of the things that are important to me. And you can get the template right here to help mindfully monitor the things that you want to keep an eye on. Firstly, just the act of completing a daily tracker prompts you to think about your day, how you’re feeling and what’s going on. I really noticed this during the week with my food diary - I was so much more aware of whether I was hungry, how I feel when I need to eat, and how I eat when I’m tired (clue - not so well). 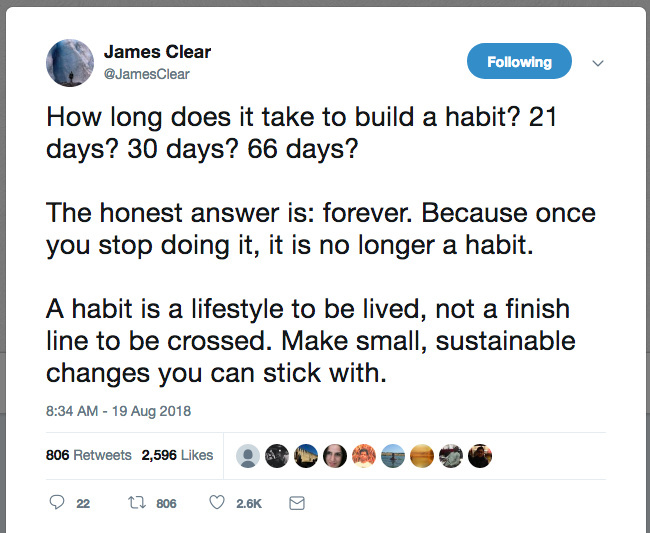 Yes, you have to remember to fill it in - I often do mine as I’m cleaning my teeth (pairing a new habit with an existing one) - but some of this just does take a bit of discipline. Secondly, you can start to spot patterns. Like, if I work 14-hour days, 4 days in a row, and run every morning, what then happens to my energy and mood? How long does it take me to recover? Sometimes, you might not notice the effects of, say, a bad night’s sleep for a couple of days - writing it down and paying attention allows you to recognise these associations more easily than just relying on your memory, which quite frankly is pretty rubbish at this. So that’s mindful monitoring. Let’s talk about planning. I love a good plan. I got teased last night at a trustee meeting about gantt charts - yep, I am that person. Give me a spreadsheet and I am a happy bunny! Henry Ford once said “thinking is the hardest work there is”. Time spent planning is never wasted. Taking some time at the start of every week to get clear on what you want to achieve and how much time you need will make sure your energy and attention are focused on the things that really matter. Here is the planning template I use (most of the time) to help me get my priorities clear and mapped out. The big rocks go in first. I fit the rest of your life around the important things first, even if that means some of the other things don’t get done. I’ve learnt that I have to schedule the fundamentals first. These are non-negotiable. Like my running. When it’s in the diary and I’ve made a commitment to myself, I stick to it and I start to build up trust with myself. I’ve started to become a trusted colleague - when I say I’ll do something, I do it. I’ve also learnt work expands to fill the time you have so I now set myself much stricter time limits. I try to work hard in the time I allocate and then enjoy the downtime I’ve planned. And there is always a lot of time - it’s just how you’re choosing to use it. Think of your week as 21 blocks of time (morning, afternoon, and evening x 7 days). At least one of these should be dedicated to something fun and playful, preferably during the week – you don’t have to store up all the fun until the weekend! At least of one your 21 slots should be kept clear each week. Empty space is important to allow you to be spontaneous or to just curl up on the sofa for an afternoon. Top tip - don’t do emails first thing [I hate the concept of ‘doing’ emails but you know what I mean]. It immediately puts you into everyone else’s first priorities, rather than yours. Try spending the first 90 minutes of your day on the thing that is most important to you. I love that sense of achievement of doing something I care about right at the start of the day - it sets me up for the rest of the day. Well, most of the time - other times, I’ve peaked about 10am and don’t get much else done but at least I got the most important thing done! I find this system really works. When I do it. Last week, I got lazy and didn’t prioritise. Because it’s hard! I wanted to do all of these things and go to interesting events, and, and, and. Now I’m not saying every week has to be perfect - far from it. Some weeks, life is just really busy and everything is happening. I just know that I can’t do that week after week after week without my health and happiness paying the price. And that’s not a price worth paying.